U.S. corn represents a sustainably produced, economically competitive, and extremely flexible feedstock for bioproducts. U.S. corn farmers continue to adopt new innovative production practices, as a result their production efficiency continues to improve year-over-year, producing more with less. However, these advances now support production that greatly exceeds annual U.S. corn demand. In fact, production this year is forecasted to exceed demand by nearly 50 million metric tons. Additionally, new technologies are being deployed that will provide clean product streams (sugar, lipid, proteins) as feedstocks for processes. At the same time, consumers worldwide continue to demand additional bio-based products. This confluence of available corn-based feedstocks and consumer demand represents an extremely exciting opportunity for stakeholders in the sustainable bio-materials industry. Consider Corn Challenge II is seeking proposals that reflect methods to convert corn as a feedstock to create sustainable chemicals with quantifiable market demand. 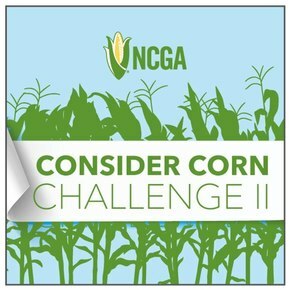 For complete details on the eligibility criteria that govern the Consider Corn Challenge II please refer to the website. For complete details on the terms and conditions that govern the Consider Corn Challenge II please refer to the website. To submit an application for the Consider Corn Challenge II please refer to the website.